Scroll down the page to find on the right a “Homework & Research” links list. It is here to help you search for your studies and I encourage you to explore it… and use it. On AnyQuestions.co.nz , you can email to real online librarians, trained to help you work out the sort of information you need, then begin searching with you. Visit the ManyAnswers database first for hundreds of previously asked questions and links to the information found. The Username and Password must not be published in any publicly available format but are largely advertised in the school or ask the librarian. Te Puna Web Directory is an organised listing of New Zealand and Pacific Island web sites, great to find all the good websites in a subject or a place. Te Ara – The Encyclopedia of New Zealand offers many pathways to understanding New Zealand. It is a comprehensive guide to the country’s peoples, natural environment, history, culture, economy, institutions and society. It’s my favourite “cruise” website! 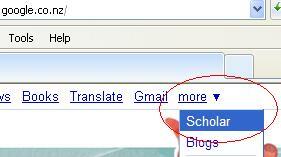 And if you still prefer Googling, then use Google Scholar which provides a simple way to broadly search for scholarly literature. Find it in the More menu. Make the most of these great websites, your knowledge and your marks will improve amazingly!